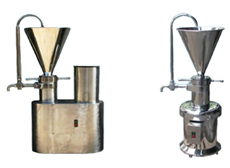 Feed Hopper, recirculating pipe & mouth hopper are supplied as standard with colloid mill. Available in Jacketed / Non-Jacketed type. Special 3 way valve is provided for recirculation & discharge of the product. Finish products available as low as 5 micron.